Penguins can taste only sour and salty food, scientists have discovered. A genetic study suggests the flightless birds lost three of the five basic tastes long ago in evolution. Taste is critical for survival in most animals, but may not matter in the penguin, which swallows fish whole, say researchers in China and the US. Many other birds are unable to taste sweet things, but they do have receptors for detecting bitter and umami (or meaty) flavours. 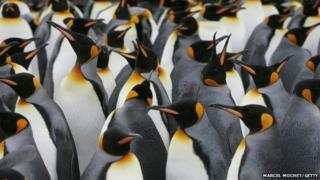 The discovery was made when researchers decoding penguin genomes found some of the taste genes were missing. A closer look at the DNA of penguins revealed that all species lack functioning genes for the receptors of sweet, umami, and bitter tastes. "Based on genetic data, penguins are believed to have sour and salty tastes, but have lost sweet, umami, and bitter tastes," lead researcher Prof Jianzhi Zhang, of the University of Michigan, US, and Wuhan University, China, told the BBC. The umami taste gives food the strong, savoury flavour associated with meat. Lacking this sense is surprising for a carnivorous animal, but does not matter that much in the penguin, which swallows fish without chewing. "Their behaviour of swallowing food whole, and their tongue structure and function, suggest that penguins need no taste perception," said Prof Zhang. "Although it is unclear whether these traits are a cause or a consequence of their major taste loss." The findings, published in Current Biology journal, were a puzzle, he added. One clue comes from the bird's evolution on the frozen ice sheets of Antarctica. Sending signals from sweet, umami, and bitter (but not sour or salty) taste receptors to the brain does not work at very low temperatures. This may have led to the penguin gradually losing its sense of taste, say the researchers. Intriguingly, the sweet taste is missing in almost all birds. The hummingbird, which feeds on sweet nectar, is an exception.